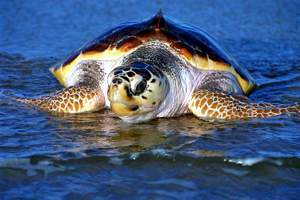 Two species of sea turtles come to nest at Playa Bluff permanently: the leatherback (Dermochelys coriacea) and the hawksbill (Eretmochelys imbricata). 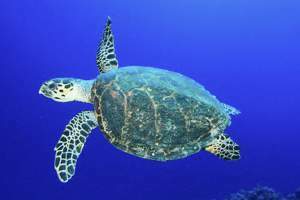 Two other species do sporadically: the green (Chelonia mydas) and loggerhead (Caretta caretta). 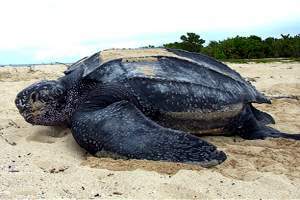 Undoubtedly, the leatherback is the star of the beach, both for scientists who have accompanied their nesting for several years, and for tourists who are impressed by its large size and slow at the drag by the beach when is in search of better place to nest and when he finished his important task and return to the sea. 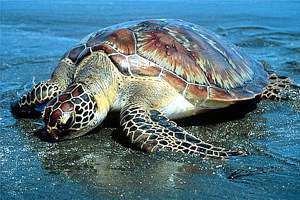 Several human related activities threaten the continuity of these species, the more important are the theft of nests and the killing the turtles on the beach. We can also add the plundering of nests by pets, compaction of the beaches by vehicles or constructions, the killing of females and males at the time of copulation in the sea off the beaches, and the capture incidentally while fishing for tuna or using longlines. Other threats that are considered natural, but also add to the above, are predation of the hatchlings newborn as they crawl along the beach towards the sea by crabs and bird, predation that continues in the early stages after its entry into the water. For these reasons, all species of sea turtles have been listed by the RED BOOK of the International Union of Conservation of Nature (IUCN) as endangered of extinction. Website by Visual Adventures Panama.